On the topic of immigration, politicians, regardless of political affiliation, spout one of two positions. On one side, it is anything goes: free healthcare, education (even in-state tuition), police, fire, food stamps, citizenship, etc. Those that prefer this angle want all illegals to be dependent upon the state. These are liberal Democrats. On the other side, we have the apologists that want a path to citizenship. These are RINOs. Ever single illegal that is in the USA is a citizen of some other country. Few sneak into the USA with a goal to become an American citizen. Their main motivation of coming to America is economical. A path to citizenship should not be the primary part of any new immigration law. It is a reward that does not need to be there. 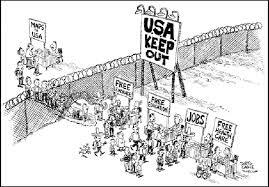 Any immigration law should not reward any illegal entrance. Green card? Sure, but not citizenship.